Even though their value has slipped in the age of around-the-clock digital news, the endorsement of a major daily metropolitan legacy newspaper still has some value. If nothing else the headline can be a snappy graphics to place on the ever-present mailers. For the Sacramento Bee, and the candidates for Elk Grove mayor and city council, that endorsement still provides validation for a segment of the electorate. In an endorsement posted this afternoon titled "There’s only one team that can lead Elk Grove into the future — and the current mayor isn’t on it," the Sacramento Bee Editorial Board endorsed Vice Mayor Darren Suen for mayor. Suen and Tracie Stafford are challenging first-term mayor Steve Ly for the two-year term. Along with Suen, the Bee's editorial board also endorsed incumbents Pat Hume and Stepanie Nguyen for district seats 2 and 4 respectively. Hume and Nguyen are being challenged by Andres' Ramos and Cosumnes Community Services District Director Orlando Fuentes. In making their endorsement, The Bee cited Suen's experience as a civil engineer saying it will offer "expertise in land use, transportation, and flood management - all things that will serve Elk Grove well as it grows." While Ly earned the editorial's board nod in 2016, this cycle they backed away, but for seemingly unspecified reasons. The implication for not offering the endorsement is the lack of support Ly has among his four peers on the city council. The editorial board noted: "'If re-elected, the mayor insists he would have no problem governing because “everything heals after a campaign.' We aren’t so sure, though." Suen has earned the support of Hume and Nguyen, along with council member Steve Detrick. On numerous occasions during his first term as mayor, Ly has openly feuded on the dais during meetings with any one of his colleagues. 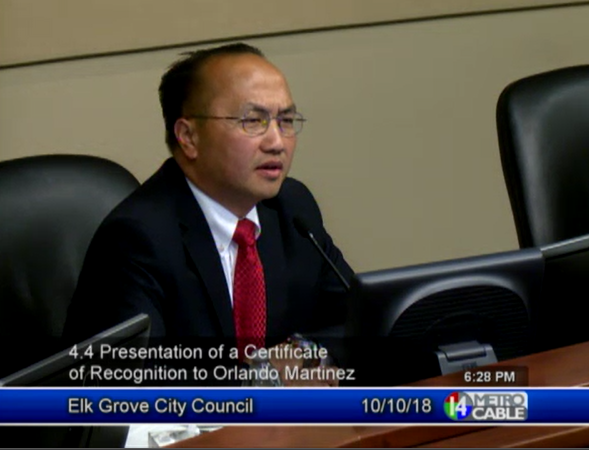 Even though the endorsement is welcome news for Suen, Hume, and Nguyen, the Bee showed their lack of understanding of Elk Grove's system of governance. While complimenting Stafford noting she has promising ideas, the Bee recommended that if Suen wins the race, she should instead seek the District 1 seat that he currently occupies. Unfortunately, short of selling her house and moving before this coming January, Stafford currently lives in District 2 and would not be eligible for the appointment, if that is the route the council once again takes. After reading what the Bee Editorial Board had to say, for the candidates getting the endorsement it is kind of like getting a kiss on the cheek from your aunt. If you think back to endorsements in 2012 and 2016, the Bee does not seem to focus on the merits of the particular candidates. Instead, they seem to look at electability, and in their eyes that means money. In 2012 the Bee went with Gary Davis, and in 2016 they endorsed Mr. Ly. Is it any coincidence in both races not only was the person they endorsed an incumbent but had raised the most cash. So yes, the Bee endorsement does help, but really what they are engaged in is nothing more than supporting the person they think has the best chance of winning, not who will best represent the interests of the residents.